I love beading and my favorite is peyote. And so I`ll be here to look and learn, and get inspiration. I just wanted to introduce me, even if I can not vote so on the basis of language. Your English is delightful! I know native speakers who can't write half as well. Feel free to drop by anytime, tell us about yourself (would love to hear more about life in your country!) and if you wouldn't mind, please share some pics of your work so we can all drool! But you will read about me, and see pictures of my work over time. Look forward to seeing more of your posts! So glad you can feel like you're here, without taking a step out of your living room! The Internet makes things feel soooo close. Can't wait to see your work...when you're ready, of course! Mistakenly I have introduced myself in the crochet forum*g I rarley crochet. Is not so completly mine. When I get excited, I do that kind of thing. Beautiful work...thanks so much for sharing! Did you design these yourself? No worries! I can have this thread moved to beading. I'm not sure when, but once it's moved there will be a message saying where it was relocated to. I love peyote stitch! It's so versatile. Slow, since it has to go bead by bead, but anything hand crafted is slow to make. LOL, if I wanted something fast, I'd buy it already made, but it's more about making it! I crochet and knit (and still do some cross stitch), but beading is still my top favorite thing to do, so I understand your feelings about that! 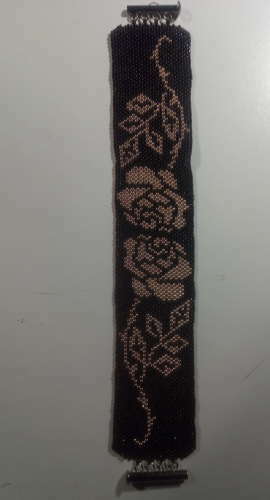 I have the braclet with the rose, after a template refinished. I´m not yet able to convert a sample idea into peyote. So I`m here to use your program to do that But with the program I still have difficulties*g I don`t think I fully understand the function yet. Maybe I expect too much from the program. So far I was able to take over from finished examples, so I didn`t to worry about the width and length of my head. I am still a beginner of designing patterns myself. 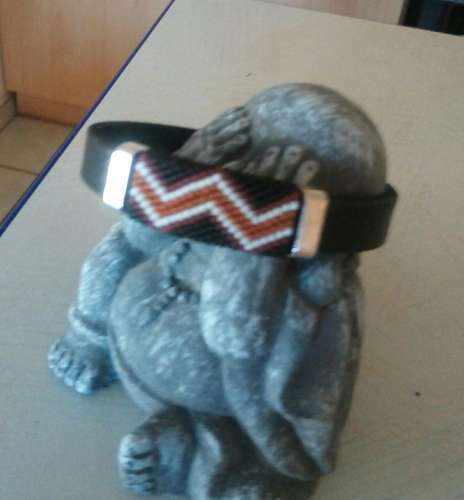 I created the peyotepart of the leatherbraclet by counting the pearls with the help of a strong enlargement of the picture. I couldn`t make a photoalbum. Uploding photos doesn`t work lilke here. The window that opens there requieres a URL adress. I cannot reach my computer files over it. The important thing about the program is to make your original image the size in pixels as you want it to be in stitches (beads, in this case). So as an example, if you want 20 beads it should be 20 pixels. The length can't be adjusted at this time. At a later date that will be available. Instead, the system currently figures the vertical size (rows) by keeping the aspect ratio correct. I'm not sure what you're looking at that's requesting a URL? When I go into albums, all I get is a "browse." Unless you're looking at a message window? If so, to get into photo alubms, go to "social" on the menu bar, then choose "member photo albums." Choose "Your photo albums," then "Create new album." After giving it a title, description and tags, you should be at a window that says "Upload Images" and it should have a bunch of "Browse" buttons. I understand how it works with the photo album. I createad one with pictures from my homeland. I´m going to make albums of my work little by little. But I have to resize all the pictures first. URL prompt pops up when you go to insert image without having previously entered titel,text and tac`s. It*s a firefox window. Oooh, will check out your photos! Thanks for uploading! We've increased the sizes of the images a bit that you can upload, so I hope that helps. I see what you mean...glad you figured it out! I like your saying. We have a similar one, but ours is "Put the cart before the horse," since carts are traditionally pulled by horses and not placed in front of them. Your English is fine and even us who are native to English don't always speak so well either. I hope that you are able to learn and teach us here in this community.